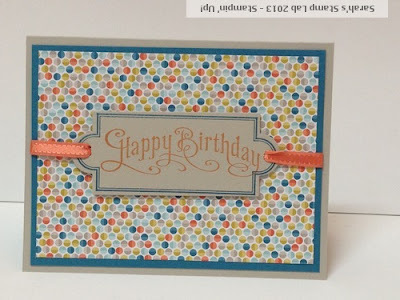 Today I'm going to show you another card featuring the new single stamps that Stampin' Up! is offering. Remember, these are only available for a limited time - until the end of March! To make the slots on either end of the tag, I pierce three holes next to each other in a vertical line with my piercing tool. Then I thread the ribbon through the holes. Designer Series Paper: Sycamore Street (SAB #127540) ONLY AVAILABLE UNTIL MARCH 22ND! I think they extended the date on these, right? I am starting to want the Basic Label. Lovely card.